A sculptor hires young college girls to take care of his elderly mother and his supposedly insane sister, both of whom live in the old family mansion with him. A young couple moves to a quiet New England village, only to soon find themselves mixed up in mysterious rituals. Helen Hill: Men can be quite a bit lower than the angels. Two women move to 1930's Hollywood in order to build new lives. Slick, colorful Gothic horror tale features the veteran leading ladies in top form. 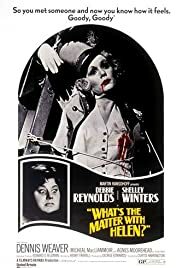 Debbie Reynolds perfects that 1930's platinum blonde/Jean Harlow image, and Shelley Winters gives what is possibly her all-time best performance as the maniacal Helen. The film was directed by cult favorite Curtis Harrington, and was written by Henry Farrell author of the novel on which the classic film WHAT EVER HAPPENED TO BABY JANE? was based. Farrell has concocted an equally effective mixture of horror and hollywood here. Harrington's next venture into the macabre was the similarly Gothic and atmospheric WHO SLEW AUNTIE ROO?, also featuring the inimitable Shelley Winters in the titular role.